Aberdeen Flowers create beautiful hand tied bouquets for all occasions, with the freshest flowers supplied to us directly to us from Holland to ensure their longevity so that you and your recipients can enjoy beautiful flowers for longer. Aberdeen Flowers Hand tied bouquets are made special because of their personal touch. Florists Aberdeen make everything to order and put their passion for flowers into everything they make. Our Florists at Aberdeen flowers take care and time over each of the bouquets we put together. Each of Aberdeen Flowers’ customers are important to us so we create each floral arrangement with them specifically in mind. Customer satisfaction is of the highest importance to us at Flowers Aberdeen because we always want you to be delighted with everything you order from us. Aberdeen Flowers have a team of highly skilled, creative florists who are passionate about providing beautiful flowers and making people smile every day. Whatever your reason for ordering flowers, whether it’s for a birthday, anniversary, congratulations or get well soon, Florists Aberdeen will be certain to have something here in our wide range of all different flowers that you will love. Our 40 years of experience here at Flowers Aberdeen mean that we have the expertise necessary to help you choose flowers whatever the occasion or reason for sending flowers. Our Florists Aberdeen always love being a part of your gift giving so you can rest assured that we will do everything in our power to ensure that your order is carried out to the highest standard and that your flowers are even more beautiful than you would expect. 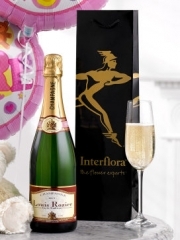 Aberdeen Flowers have a range of gifts that we can send with your flowers such as Chocolates, balloons and many more gifts including the finest Laurent Perrier Champagne. Aberdeen Flowers can personally deliver flowers in and around Aberdeen we also have a network of trusted florists throughout the UK and internationally too. Flowers Aberdeen even offer a same day delivery service so that if you are in a hurry to have your flowers delivered they can arrive on the day you order them. For this we only ask that your order be with us before 3pm so that we have plenty of time to give your flowers the care and attention they deserve and ensure they are delivered promptly to the correct address to brighten up your recipient’s home. If you are unsure what you would like you can choose from the many beautiful designs available on the Flowers Aberdeen website and trust our Florists Aberdeen to bring your recipient something beautiful. On the other hand if you know exactly the flowers and colours you would like to be included, you can make use of our bespoke service to specify every detail of your order and we will be delighted to make it up just as you need. This way you are in total control of your Flowers Aberdeen arrangements so whatever your taste they are guaranteed to be just what you wanted. If there is something special we don’t have in the shop our Florists Aberdeen will be delighted to locate it for you so we can make sure that you get just what you need as we are always ready and willing to meet your requirements, whatever these may be. Should you have any questions one of our florists at Aberdeen Flowers would be happy to help you. You can contact Florists Aberdeen in our shop, over the phone or online and we will do everything we can to assist you with any query you may have or to place an order.